Deja Date is book number 9 in the Better Than Never Date series by Susan Hatler. I always enjoy the short stand alone novels in the series as they give you the dose of romance which warms your heart up. 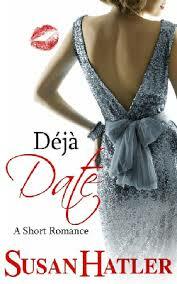 Deja date did not fail to deliver on the short and sweet romances which has been synonymous with this series. I was so in love with the books and its characters that I was left wanting more at the end. Susan has done a brilliant job with chemistry between Melinda and Nate who are faced with a second chance romance between them. I personally did not find any flaws in the writing and I felt a part of the story the entire way because Susan made the characters so realistic and engaging. My favorite part of the book was the growth of Melinda's character as she fulfilled her fathers Carpe Diem list throughout the book. Melinda story reflects the regrets we all live with in our lifetime and it sends out the message to all readers about how we must not just go through the motions of life, but actually live it by seizing the day. Hats off to Susan for a lovely romance book filled with drama which captured the readers heart and left us all longing for more. Melinda Morgan, who has recently lost her job, walks into her favorite bakery owned by Bernie who is like a second father to her. She finds out that Bernie is ill and agrees to help in run his bakery, little did she know that his adventurous son Nate is back in town. Nate is Melinda's first love, kiss and greatest heartbreak all in one. When Melinda finds out that Bernie is selling the bakery, she realizes that the bakery is the key to her happiness and fulfilling her childhood dream of owning the bakery. In order to obtain the funds, from her inheritance, to buy the bakery she has to complete her late fathers Carpe Diem list. The list contains tasks which challenge her to take risks and open up her heart- like dating someone who makes you breathless.